THOMAS JEFFERSON. Printed Document Signed as Secretary of State, An Act authorizing the Secretary of the Treasury to finish the Light-House, on Portland-Head, in the District of Maine. August 10, 1790, [New York, N.Y.: Francis Childs and John Swaine]. Signed in type by George Washington as President, Frederick Augustus Muhlenberg as Speaker of the House of Representatives, and John Adams as Vice President, and president of the Senate. 1p. 9¾ x 15¼ in. Evans #22955. On August 7, 1789 the First Congress passed “an Act for the establishment and support of Lighthouses, Beacons, Buoys, and Public Piers.” The measure made the U.S. Treasury responsible for existing lighthouses and other navigational aids, provided the states in which they were located ceded them to the federal government within one year. 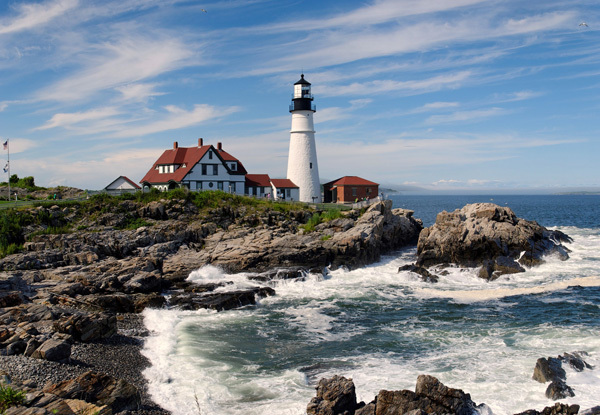 Construction of the Portland Head Light had begun in 1787 with a $750 appropriation from the Massachusetts legislature. (Maine would not become a separate state until 1820.) On June 10, 1790, Massachusetts agreed to cede its lighthouses to the federal government. Two weeks later, on June 24, Hamilton wrote to Benjamin Lincoln, then the collector of customs for the port of Boston, and asked him to procure “an Account of the Cost of the Light House, so far as it is built—the height to which it is carried—the height to which it is proposed to be carried, and an estimate of the expence that will attend the Completion of it.” Lincoln replied on July 3 after consulting with one of the builders that the structure currently stood 58 feet high and would cost $700 to complete. On July 30, Hamilton responded that he was holding off requesting an appropriation from Congress until the state’s notice of cession had been received. Passage of this act gave Hamilton the money needed. On October 4, he instructed Lincoln “that no time may be lost” The 72-foot lighthouse was completed before the end of the year. On January 10, 1791, newly-appointed keeper Joseph Greenleaf lit the 16 whale oil lamps powering the lantern for the first time. Several changes were made to the structure over the years. During the Civil War, for instance, while raids on shipping became common and ships needed to be able to spot the lighthouse as soon as possible, the tower was raised eight feet. Following a law passed on September 15, 1789, Thomas Jefferson, as Secretary of State, signed two copies of each law, order, vote, or resolution of Congress for distribution to the executive of every state. At the time this resolution was passed, there were 13 states, so it is very likely that just 26 copies were signed by Jefferson to be sent to the governors.